Archbishop Anthony (in the world – Andrew Hilarionovich Shutov, 1800 – 1881) was born in the village of Nastasyino in the Podberezinsky oblast of the Kolomensky district, to a family belonging to the governed (New-Rite) church. His father, Hilarion Terentyevich, was a peasant. In his youth, Andrew Hilarionovich converted to the Theodosian denomination (that is, bespopovtsy – those without clergy). He lived at first with the Moscow merchant F. Guchkov, and then at the Transfiguration Cemetery, taking the post of treasurer. After 1845, he accepted monasticism in one of the bespopovtsy cloisters of the Chernigov governorate and soon withdrew to Eastern Prussia, where he entered the Wojnowo Monastery. The rector of the monastery received him with a very unfriendly manner, and so around 1851 he crossed the Austrian border and settled with other Theodosian monks in the village of Klimoutsy, near Belaya Krinitsa. Soon he met the monk Paul of Belaya Krinitsa. Often talking with him, Anthony, learned the details of the emergence of the Belokrinitskaya hierarchy and became convinced of its legitimacy. In February 1852, he joined the Old-believers’ Church. On February 10, in a Belokrinitskaya monastery, he was tonsured again. 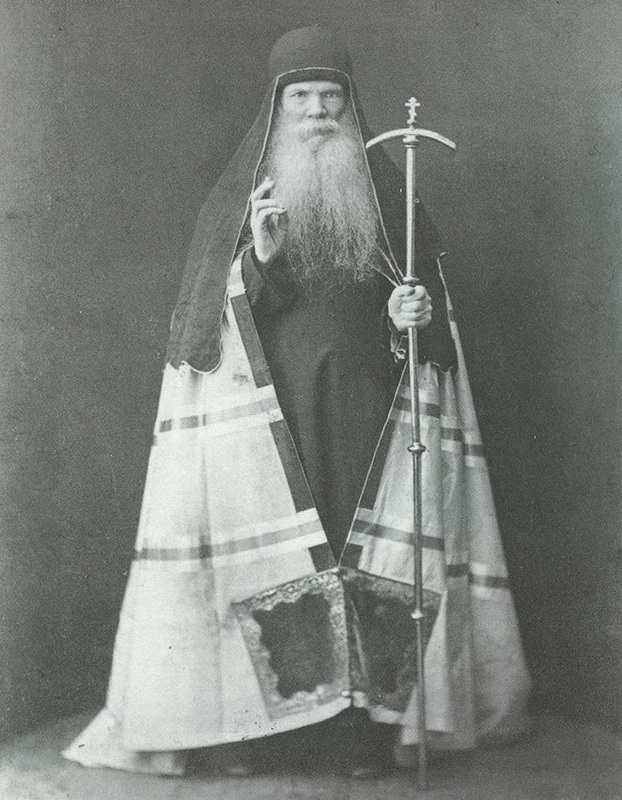 Later that year, on October 1, he was ordained by metropolitan Cyril as a hierodeacon; on December 6 – as a hieromonk, and on February 3, 1853, metropolitan Cyril ordained him archbishop of the city of Vladimir. The next day, the newly-ordained archbishop set off. When the government learned of archbishop Anthony’s arrival in Russia, it appointed a large monetary reward for his capture – 12,000 roubles. He was sought by many detectives, including volunteers; however, this did not frighten the archbishop. He remained elusive to the government, moved from village to village, spending nights in haylofts, in attics, and ordained several dozen priests during this time. This persecution continued until 1862, when, by decree of the emperor Alexander II, Old-believers’ priesthood was temporarily freed from persecution. Upon the arrival of the archbishop into Russia, the rector of the Rogozhskoe cemetery, the most authoritative Old-believers’ priest of that time, protopriest John Yastrebov, as well as the priest Pavel Tulsky recognised the archbishop’s authority over themselves, and began mentioning him during the litanies and using the newly consecrated myrrh received from him. However, not everything came together smoothly. In addition to strict supervision and persecution by the government, awaiting archbishop Anthony in Russia was another test, tied with the fact that the bishop of Simbirsk, Sofroniy, the first ordained for the Russian Old-believers, did not obey him and began planning the creation of a special hierarchy. Nevertheless, in spite of all the difficulties and obstacles, in the first nine years of his archpastoral service in Russia, Anthony ordained four deacons for the Old-believers, 70 priests, 23 hieromonks and six bishops. In 1863, by the decision of a Holy Council of Russian bishops, he was elected to the episcopal throne of Moscow. This was the recognition that he was the head of all the Old Orthodox Christians of the Belokrinitskaya hierarchy in Russia. At the same time, he also became the head of the supporters of the Encyclical Epistle, the Okruzhniki [Encyclicalists] (although for the sake of restoring fraternal peace, in order to end the non-Okruzhniki discord in the Church, he agreed to revoke the “Epistle” [Encyclical Letters], which proclaimed support for the tsar, and stated that the established church believes in the same God as them). Of his other inherent views, it should be noted that he strongly advocated for the canonisation of the holy hieromartyrs and confessors Avvakum, the priests Lazarus, Nikita, and others who suffered for ancient piety. At that time, the expression of such views was very dangerous, since the listed martyrs were considered enemies of the royal house. Archbishop Anthony was an extraordinary person. He built churches, and consecrated in his lifetime several hundreds of so-called mobile antiminses, the reserve of which has not run out to this day. Tending to the spiritual food of his flock, he did not leave anyone in material need. Old-believers throughout Russia and abroad knew him as a generous benefactor, helper in need and misfortune. For the maintenance of Russian and foreign Old-believers’ monasteries, archbishop Anthony made numerous donations with both money and various church utensils and books. Becoming familiar with books in the famous library of the monastery of St. Lavrentiy, he collected his own library throughout his life. This unique collection consisted of many rare manuscripts and early printed books. After the death of Anthony, his collection of books entered the library of the Rogozhskoe cemetery. During his clerical office, archbishop Anthony specifically kept several scribes to distribute various apologetic compositions among the Old-believers. With the same purpose, already in his declining years, he strived for the establishment of a typography in one of the foreign monasteries of the Old-believers. The active work of archbishop Anthony in strengthening the Old Belief made him the main target for all enemies of the Belokrinitskaya hierarchy, both external and internal. Even in feebleness, the archbishop did not abandon Divine worship. After serving close to a hundred liturgies in succession, on the night of November 2–3, 1881, Anthony felt “heart pains, which he had very gravely suffered from before”. Being infirmed for several days, having received Unction and Communion, the bishop died on November 8 (November 21 in the new style calendar) at 7 am in Moscow, in his small apartment on Pustoy street (now called Marxist). On November 10, he was the first of the Old-believers’ bishops to be buried at the Rogozhskoe cemetery. “The external image of bishop Anthony was of the most reverential kind: his face was of extraordinary whiteness; he had a rather long beard, wide and white, like silver. His speech was quiet and pleasant. It can be said about him in all fairness that he was in all respects the exact impression of the former, true shepherds of the flock of Christ’s word,” as G. A. Strakhov wrote about him.